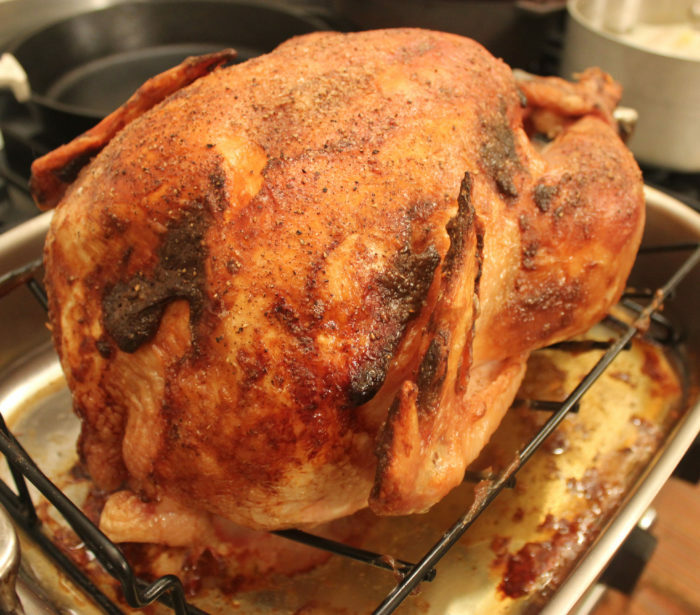 If you google “how to roast a turkey” there are now about 30 million hits. Probably too much for you to consume as you the annual search for how to get a perfect turkey. Here’s an easier path. These pictures are from last Christmas when Suzi and I cooked a Butterball turkey and had great success. We had just had the Butterball team at Cooking by the Book where they sponsored Butterball University for major bloggers. The Butterballers taught folks how to defrost, cook and carve the birds. For that event, Butterball shipped us twenty 20-pound birds. We had to rent three refrigerators to store them all. The bloggers learned a lot and so did we. We had one left over for Christmas! First, Butterball is now a private brand with very careful control of the entire turkey raising and packaging process. These birds are easy to prep and cook at home, decidedly easy. You can pop one in your pre-heated oven, and in about three hours, when they register 165 degrees internally, you are ready to pull the bird, let it rest for several minutes and then begin slicing. In all those millions of websites, you will find many ideas about how to get that perfect skin on your bird, that deep brown color with just the right finish. You’ll find advice about rubbing with butter, using melted butter, different juice and oil, covering with foil or which cheesecloth, … Many suggestions and you can easily feel overwhelmed. Here’s what the Butterball people told us to do. 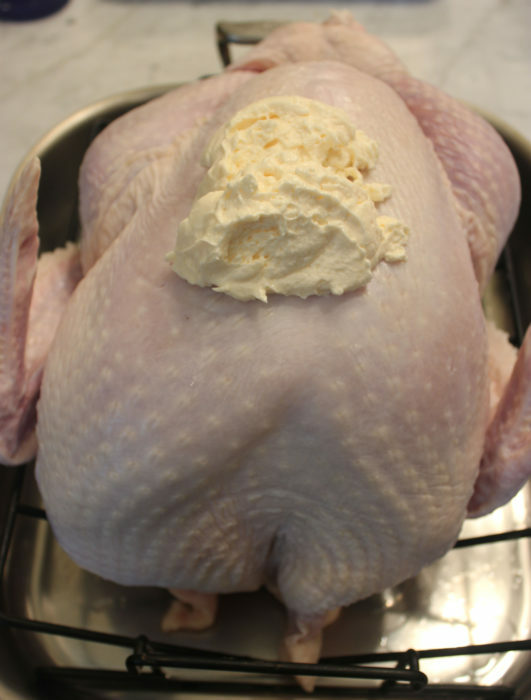 Put a generous pile of mayonnaise on the bird, spread it around, add salt and pepper, and cook away. Yes, some basting is recommended. But this is a very simple routine, one that results in the perfect bird you see at the top. Our Christmas bird was full of flavor with both the dark and white meat done but not dry. A total bird, totally delicious, and easily prepared. So, for this holiday season, we recommend you go Butterball. Don’t hold the mayo. Oh, one thing. 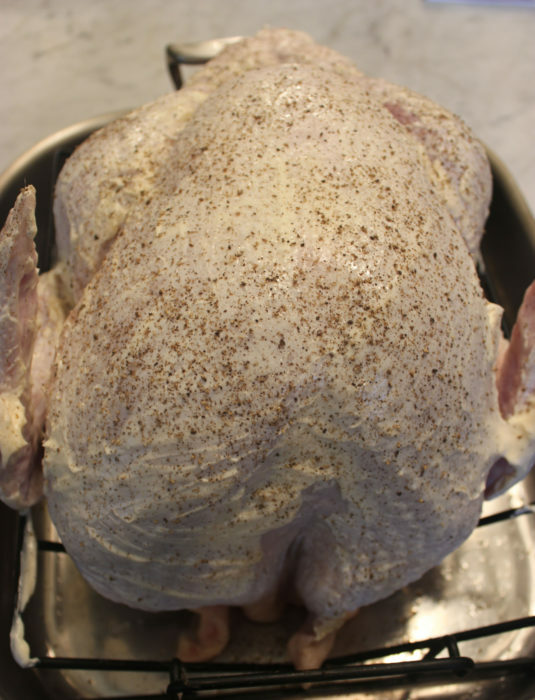 A single turkey can defrost in your refrigerator in a couple of days or so. 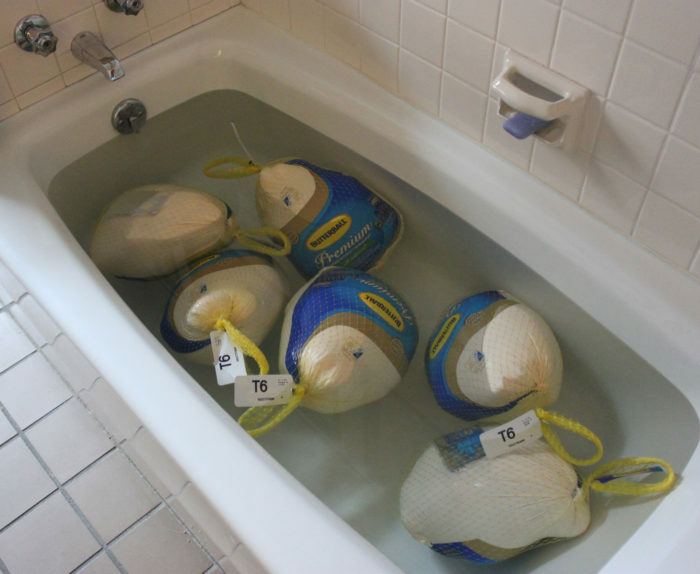 Six turkeys in that fridge? Oh, it’ll take time. After three days in the fridge, these six boys were still rock solid. The solution? Clean your bathtub. Before and after.